Discussion in 'Jokes' started by sonu, Sep 23, 2005. I got this forwarded to me by a friend. It was very nice, hence wanted to share. Though not applicable entirely to Indian way of living (may be more applicable to Western way of living), still most of them should be lovely to practice! Q- Quit Quarrelling Constantly -- If the issue is over 48 hours old, let it go! "You are going to have a pleasant experience. "...in bed. 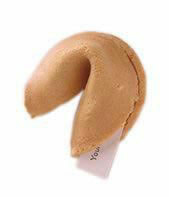 P.S: For those who don't know what a fortune cookie is, please see the picture below. It is a cookie that most restaurants provide along with the bill. When you open the cookie there is a small piece of paper with a fortune message. "You are broad-minded and socially active in bed!" My husband asked me, what does being socially active in bed mean ?! ?